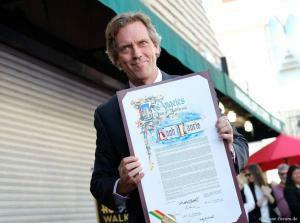 British actor, comedian, producer, director, author, and blues man, Hugh Laurie, received a star on the Hollywood Walk of Fame on October 25th. The brainchild of former Hollywood Chamber of Commerce president, E.M. Stuart, the Chamber and City unveiled the first eight stars on Hollywood Blvd on August 15th, 1958. Laurie’s star is the 2,593rd such honor. He was a champion rower at Oxford University, before a bout of mononucleosis forced him to abandon the sport. It was then he joined the Cambridge Footlights, the university drama club. He also met actress, Emma Thompson, who introduced Laurie to his future comedy partner, Stephen Fry. The two went on to many successful ventures in the 80s and 90s. In 2004, he took on the role of Dr. Gregory House in the popular Fox medical drama, House. He was nominated for an Emmy Award and won two Golden Globes and two Screen Actors Guild awards for his portrayal. “I have lost count of the number of times, the number of young people I’ve met who are either studying or practicing medicine because they saw House,” Laurie said. His other acting credits include the films, “Sense and Sensibility,” “The Man in the Iron Mask,” and the television shows, “Veep,” and his current program, “Chance,” in which he plays another doctor on the Hulu network. A talented musician, he began taking piano lessons at the age of six. He also plays guitar, drums, harmonica, and saxophone. Laurie has released two albums on the Warner Brothers label. In 2011, he released, Let Them Talk, which was a collection of 15 classic blues songs. Some of the tracks included the Professor Longhair tune, “Tipitina,” and the 1937 Robert Johnson classic, “They’re Red Hot.” His 2013 release, Didn’t It Rain, was a combination of blues, jazz, tango, and R&B. Both albums went to #1 on the Billboard Blues Chart. His recording and touring partners are the Copper Bottom Band, made up of musicians, David Plitch, Kevin Breit, Greg Leisz, Patrick Warren, Jay Bellerose, Vincent Henry, and vocalist Jean McClain aka Pepper MaShay. A current gospel Grammy nominee, McClain began the Walk of Fame festivities with a rendition of “Glory, Glory.” Other artists to appear on his two best-selling albums include Dr. John, Taj Mahal, Gaby Moreno, Irma Thomas, and Allen Toussaint.